The AFRL Materials and Manufacturing Directorate Erosion Team conducted a series of coatings durability tests for NASA’s Mars 2020 rover, pictured here in an artist’s rendition. Air Force Research Laboratory researchers are doing their part to make the next Mars rover mission an astronomical success. At the request of NASA’s Jet Propulsion Laboratory and project partners, AFRL recently concluded a series of tests in the Particle Erosion Test Facility, located in the Materials and Manufacturing Directorate’s Coatings, Corrosion, and Erosion Laboratory. 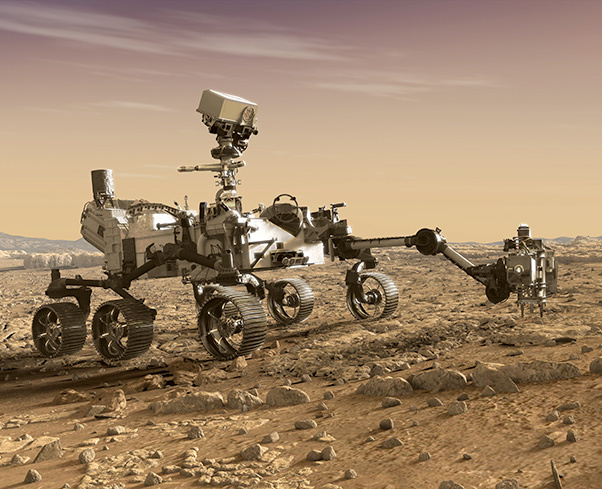 For this effort, AFRL experts evaluated the effects of dust, particulates, and small rocks on the protective surface coatings of the Mars 2020 rover vehicle. The Particle Erosion Test Facility is one of many testing capabilities housed within the AFRL Coatings, Corrosion, and Erosion Lab. Other specialized tools include the Supersonic Rain Erosion Test Rig, the Hot Erosion Rig, and Whirling Arm Rain Erosion Test Facility. The AFRL Erosion Lab is also home to advanced laboratory capabilities for in-depth environmental particulate analysis. According to Shumaker, this combination of test equipment along with the group’s expertise and characterization capabilities enable the AFRL Erosion Team to be a world leader. He said the Erosion Team is also involved within the NATO Science and Technology community, providing information on the impact and degradation effects of environmental particulates on platforms.